You really must have this in your kit! Brow expert and Senna founder Eugenia Weston designed this super skinny, refillable magnetic palette as the ultimate pro tool to master perfect brows on anyone. The New Brow Book Pro Palette contains 9 highly-pigmented, natural looking and long wearing matte brow powders that suit every brow and skin tone. This master brow kit also comes with 2 Browlite - a soft, matte highlighter to define the brow line and accent the arch, as well as a Brow Pomade to add texture, fullness and is perfect for creating faux brow hairs. Buy the Senna Brow Book Refills HERE! With a firm angled brush, fill in sparse areas of brow with Brow Powder. Blend with a brow grooming brush to soften and incorporate the color throughout the brow. Layer pomade over the brow color to add texture, create faux hairs, and to make color adhere and look natural. 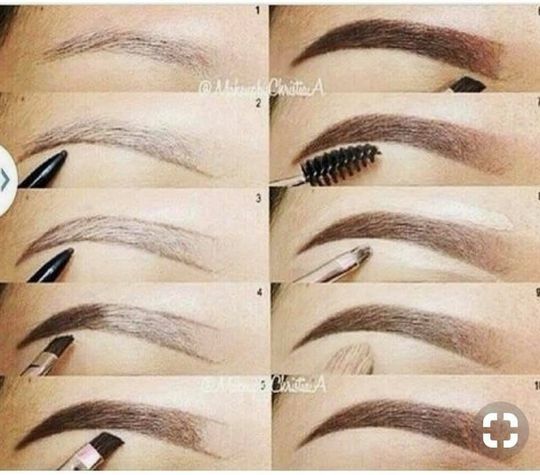 Accent brow shape with Browlite under the brow line. The Senna signature brow shape defies trends and creates a flattering frame for every face shape. Use the straight handle of a brush as a guide and mark key brow points lightly with powder color. 1. Place a dot directly above the tear duct of each eye to mark where brow begins. 2. Mark a dot directly above the end of the iris to indicate the arch point. 3. Dot the end of the brow at a direct angle from the end of the nostril to the outer edge of the eye. 4. Place brush horizontally at the beginning dot and lay across both brow bones to ensure they are level. 5. Place brush horizontally from the arch point to the top of the opposite arch to align the height of both. 6. Fill in your brow outline with powder color to create the classic shape. 7. Layer pomade over color to add texture, create faux hairs, and to make color adhere and look natural. 8. Accent brow shape with Browlite under the brow line. A high arch opens the eyes and lifts the face. Boost fallen arches by extending color slightly above the natural arch. Extending brows toward the temple makes a wide jaw line appear narrower. Before you tweeze that out-of-line brow hair, brush up, scissor trim and it may not need to go! If after filling in brows with powder or pencil the color appears too dark, lighten and soften the look by blending color into hairs using the Brow Twirler 602 Brush. Shyn M. Reviewed by Shyn M.
Diana C. Reviewed by Diana C.
Sharon B. Reviewed by Sharon B. This is a must have for any MUA. What my kit was missing! Tricia D. Reviewed by Tricia D.